I knew I wanted to join in on the fun, so immediately started thinking about what kind of soup I wanted to bring to the table:) So many tasty recipes ran through my mind that I had a hard time choosing. 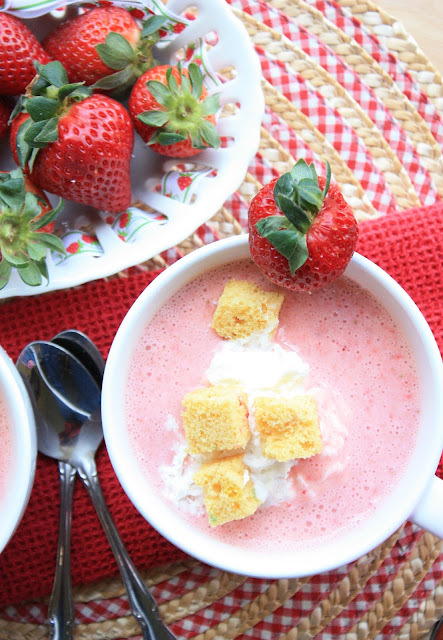 I finally decided on a recipe that I had on my "to make" list for about a year~strawberry soup! I don't know why I waited so long?!? I guarantee I will be making this soup many times through the upcoming spring and summer months! I checked a handful of strawberry soup recipes that surfaced on my google search, but finally decided on the recipe from Food Network. There were 8 reviews with an average of 5-stars. This recipe has so much going for it. First of all, it has only a few, simple ingredients and is thrown together in about 5 minutes! Instant gratification! Secondly, we found it very tasty and satisfying. The taste was not too tart, and not too sweet, but just right. Another plus is that it's healthy! It also doesn't hurt that it is naturally pink:) My husband and I finished it in a flash, and thoroughly enjoyed it. Some reviewers added sugar to sweeten it, and others added more yogurt to thicken it, but I didn't alter a thing from the original recipe, and thought it was great! I liked that it was midway between sweet and tart, but tilted more to the sweet side. I also was glad that it wasn't thicker, which kept it more soup-like, as opposed to being a smoothie. Instead of topping the soup with a sprig of mint (as suggested), I thought this would be the perfect soup to top with some homemade cake croutons(click HERE for link). ( I even had a small, baked~with sprinkles added, unfrosted cake in the freezer.) I was right; the cake croutons were the perfect crowning touch! In a blender, combine all the ingredients but the whipped topping and mint(or cake croutons) and process until smooth. Ladle the soup into bowls and top with a dollop of whipped topping. Garnish with cake croutons or mint, if desired. Love that it's not your typical soup! So pretty, too! This looks so yummy sue and those cake bits included - YUM! Oh my heck!! I LOVE this! and the cake croutons...perfect! Thanks so much for joining us!!! This looks delicious! I've had strawberry soup before but never seen a recipe for it! This is such a beautiful, creative recipe! I must make this. MUST!! It looks like summer in a bowl! Can't wait to try this. Sue I like the way you think! Fabulous!! I never miss a thing from you if I can help it b/c I have your blog on my sidebar/blogroll!! Ok, this is amazing, I would love to serve this at a spring tea party!!!! Cake Croutons...genius I say! The soup looks great and I especially love the idea of cake croutons. Ok, Sue, now you've done it - I just so happen to have a pint of strawberries in my fridge that I needed for photo props. I was going to eat them out of hand and act all healthy. Nope..I think I need to try this gorgeous soup, and there's no way I'm leaving out the cake croutons! Ooo how creative, Sue. Strawberry soup, nom nom! I have to try this. Also, about the Google friend connect, it's the opposite way around. Blogger/Blogspot blogs keep the google friend connect whereas Wordpress blogs with the HTML google friend connect will lose that feature. I was worried I'd lose mine too so researched it lol. Those cake croutons are such a fun idea! What a great recipe. This is GENIUS, especially the cake croutons!! Had both strawberry and banana soup on cruise my husband I did a few years back. when I saw it on the menu, I knew I had to try it! Love it. The cake croutons are brilliant. I have never had a fruit soup before. It's like I live under a rock or something. Truly, that bowl of strawberry delicoiusness is something I need in my life. That soup looks fabulous, Sue!